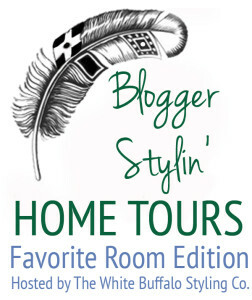 Today I’m excited to take part in the Stylin’ Blogger Home Tours with Lindsay from White Buffalo Styling Co. If you’re joining in from DesignPost Interiors, welcome! If you’re new around here, then slip off your shoes and grab a cocktail, because we’re about to jump right in. The tour is all about our favorite room, but I couldn’t decide which room was my favorite (that’s kinda like asking me to pick a favorite kid or a fave song), so I turned to my peeps on Intagram + Facebook, who voted for the master bedroom, so that’s what I’m sharing today. 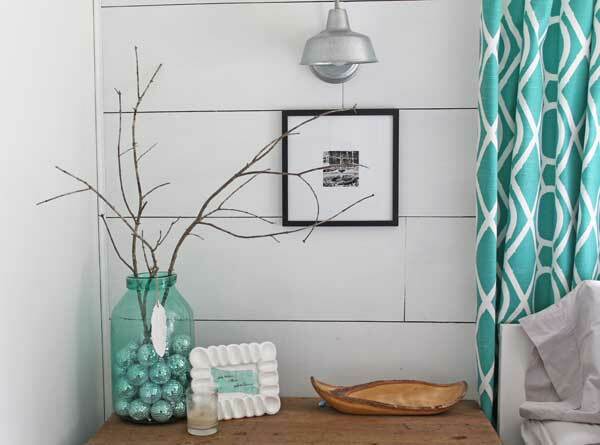 My personal style is kinda modern, quirky farmhouse. We live wayyyyyyyy out in the country, so it was only fitting to stick to a bit of farmhouse flair. And while I like a tiny hint of vintage, most of what you see will be more modern style. There’s a bit of other stuff thrown in, but everything new I buy has more modern lines. The only real heirloom piece of furniture I own is the chest of drawers that my mom gave me when I moved here. We bought our house from my parents, and when they moved she left this piece for me. It’s solid wood and seriously sturdy, but was sporting a rough finish, so I sanded it all and painted it emerald green. I was afraid we’d get tired of the color, but over a year later I still adore it. I left the original handles untouched, though, I just couldn’t bear to change it completely. I like adding in touches of fun stuff like the “WORD” art, but still keeping it real by decorating with things like branches (because – hello! – they’re free!) P.S. 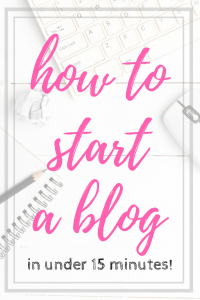 – the headboard is a DIY, too. The focal wall behind our bed is planked (to help eliminate that mobile home look). 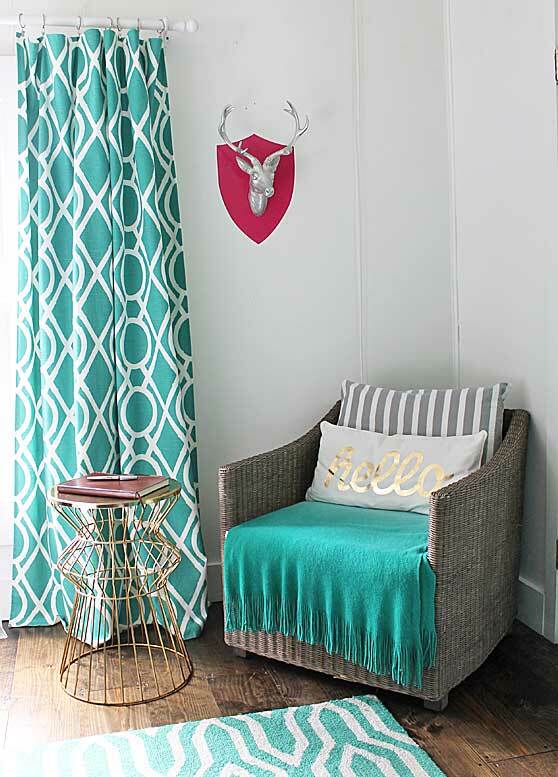 It was such a quick project, but it oozed farmhouse charm and we adore how it turned out. 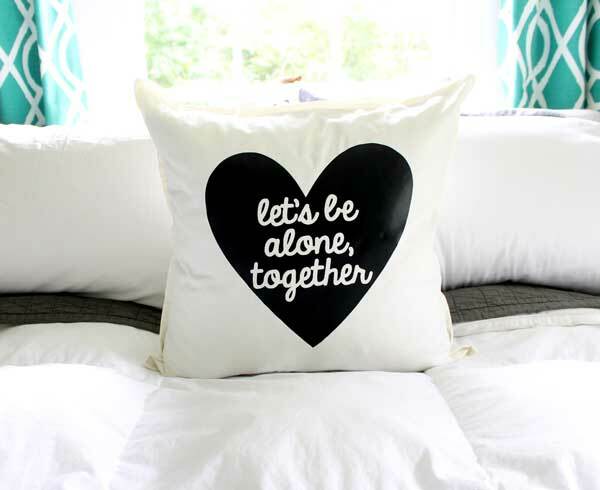 I even made the little pillow on our bed with some of the lyrics to one of our favorite songs. Which is exactly why I keep the disco balls on my side of the bed. Because they’re too girly, ya know? And that’s it for my bedroom! Jump on over to see the next house on the tour over at Dream Green DIY. It looks awesome! I love that shade of green you used. What a beautiful, fresh, crisp room! 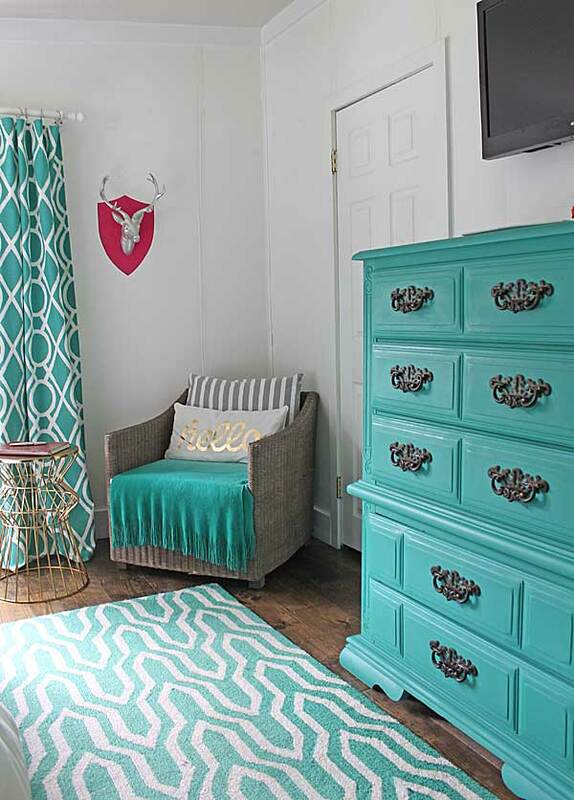 I can’t believe that rug was almost an afterthought…it was so perfectly meant to be! Lovely, lovely room, Gina! 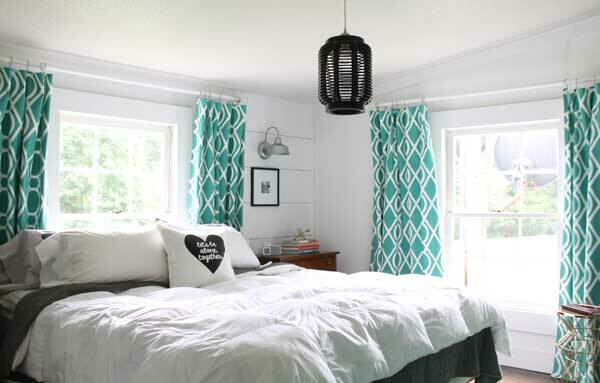 Love your bedroom, it looks so pretty and I love the green. 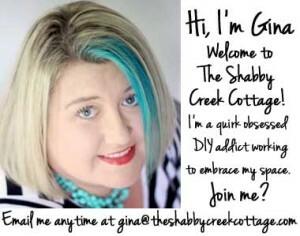 Gina, I LOVE your bedroom! 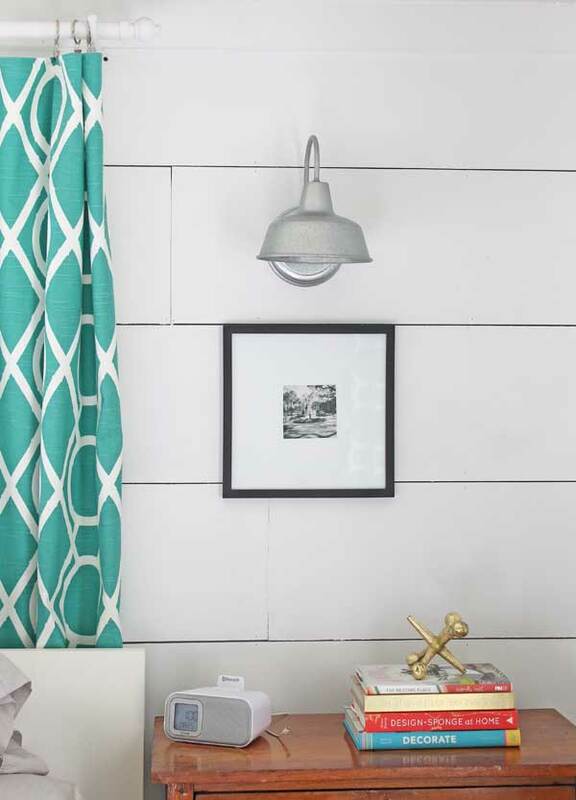 I love the plank walls, those galvanized bedside lights, and the pops of teal. It is so beautiful and comfy! Thanks for joining in! The bedroom looks spectacular. the combination of colors allows for a really nice vibe! You’ve done it again, another masterpiece! I love the entire room. Leaving the original drawer pulls was a great idea. They tie right in with your other accessory pieces. You did awesome!!! I love all of the graphic details and the pop of pink nails it friend! Love this room!! It looks so fresh and inviting. Keep the pictures coming!!! such a great space- love the color mix! I love your bedroom! Those planked walls make my heart pitter patter. Yay for clearance finds! These colors on the crisp white background are so amazing! Love love! Wow! Love, Love, Love it. I love everything about this room! 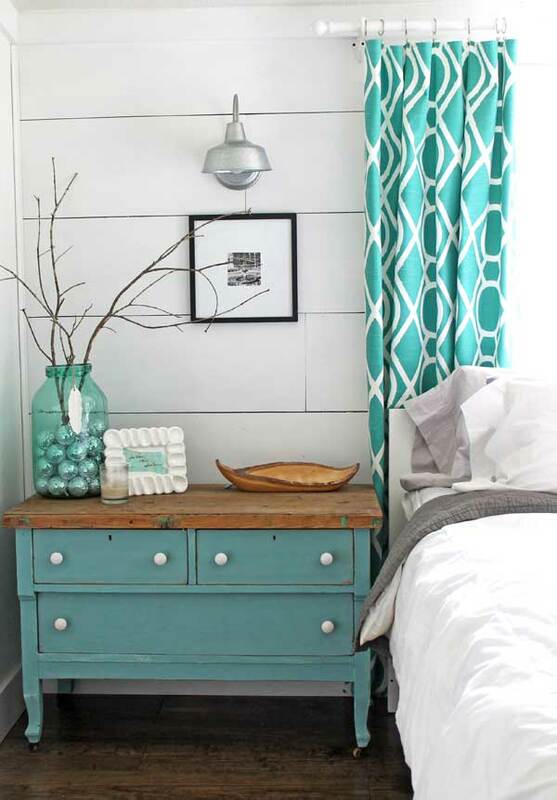 It’s amazing the impact the turquoise on white has. It’s perfection in my book! Awesome tour! Hi Gina, you said the chest of drawers was painted emerald green and still is? Is it the one in the pictures above? 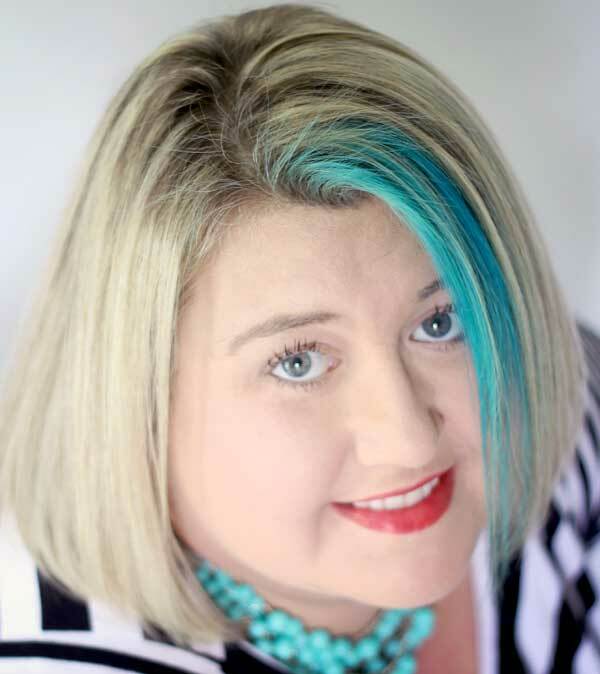 If so, I thought all this time I looked at your pictures everything was in the teal/turquoise family. 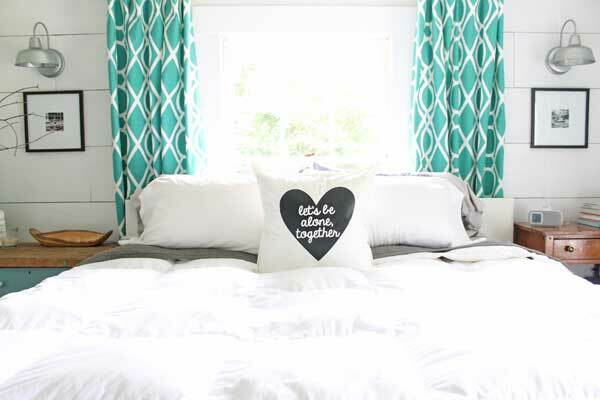 Beautiful….the accent color has me swooning! It’s so inspiring!! It’s encouraging, too, that you didn’t get tired of your use of color. I worry about that, sometimes. Is the nightstand color Duck egg?